I just wanted to take this opportunity to wish each of you the warmest wishes and blessings this Christmas season. My thoughts are with my Mom tonight and I just wanted to share these pictures, especially with her. Thank you Mom for learning to use the computer! I LOVE YOU! One of the biggest enjoyments for me is observing my children. The wonderment that is in their eyes, the joy that just comes - it is different when they are small. It seems as though some of that disappears as they get older. The first picture was taken on our annual trek to see Santa. 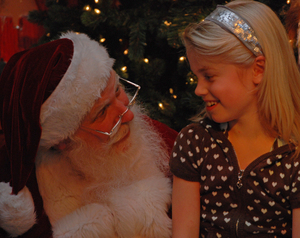 I truly enjoy this for two reasons - first is the facial expressions and wonderment that is in the little faces of those who visit Santa. I love capturing those expressions on film so that I can hold them in my heart for the rest of my life, because I know that these expressions will eventually disappear. The second is to watch the amazing changes that occur in my children with each passing year. These are the photos that really seem to capture this to the fullest being that we have been consistent in taking them. To lay all the photos out and look at the changes that occur each year fills me with a sense of wonder. 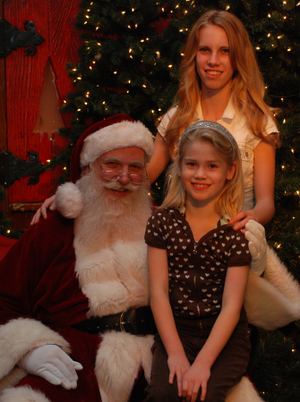 Wonder at how time can pass so fast - it just seems like yesterday that my girls were babies. This last is one of those moments that captured Katrina at her truest. Each year I get the girls Christmas jammies. I was hoping to get a card made today with one of the angels to wish you all a most happy holiday. I love the new sentiment "light fades, stars appear, evening angels gather here". I hope that you can feel the comfort and peace of the angels surrounding you this Christmas eve. My first Inchie!!! I am so excited to finally have made one and am able to share it with you :D You know how when you hear of a new idea how excited you get to try it out and put your own spin on it. Well, this little creation has been nestled in my brain for some time and tonight I finally had the opportunity to give it a whirl. I'm quite excited with how it turned out. What I also find so exciting is that I actually sat down and finished this project in a snap - WOWIE, that's a first in a long time - LOL! I have been acquiring tools over the last few weeks to help make this an easier process and I hope to share those with you soon. Everything seems to take me forever, especially at this time of year - LOL! To being with I have a possible recipient in mind for this little creation. I'm not certain yet whether she will like it and so I need to get some input from a few important people first. This wonderful lady loves birds and red - thus the beginnings of this creation. I began with an old book page. 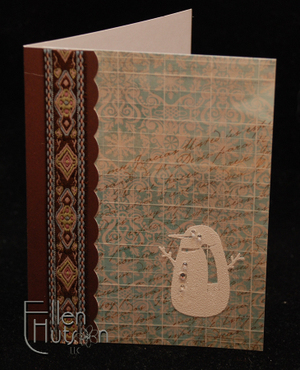 I stamped the Itty Bitty Birds on it using Adirondack Pitch Black Ink. I then colored the birds using Copics, Prismacolor Color Pencils and a Spica Glitter Pen. I made a 1" square template out of clear plastic to act as my positioning and tracing guide, so that I could get my little creation cut out in just the right spot. It is so helpful to have this little "tool" to help guide in "finding" your place on a stamped image. I will photograph it in the next project I create - I forgot this go round because I was having way too much fun. After tracing and cutting out my 1" square I adhered it to a 1" chipboard square using Matte Perfect Paper Adhesive. This adhesive is perfect for this job being it doesn't soak the paper. I'm guessing that most any white, clear drying glue would work well though. I then embellished the "nail heads" and sides with a gold leaf pen. The base layer was created using another piece of chipboard, a Lettuce Dabber, Vintage Photo Distress Ink, Clear Embossing Powder, the Millinery Holiday Embellishment stamp and some gold Rub 'n Buff. My beading skills leave a lot to be desired, but it seems that the little "dangley" did work on the bottom. In seeing this project in it's GIMUNGO size on the screen I am thinking that next time I might try sanding the text down a little first so that it isn't so dominant. What do you think??? So yet another way that you can share Inchies with your friends Ü They could use this as a pendant or hang it as an ornament on their Christmas tree. Maybe I'll give that one a try if I decide that this isn't quite the right gift after all. I hope you like this latest twist - there are many more ideas to come, so stay tuned and I'll try and "Inch" my way along being that slow and steady seems to be my way. ...to stamp, with a dear, sweet friend of mine. (sung to Jingle Bells) It has been far too long since I just stamped and explored, and... There is this wonderful woman who I am so lucky to call my friend. Mona Lisa once again drove down this weekend to spend a day with me. It was so fabulous having her here!!! I just hope and pray she doesn't get this awful cold of mine. Unfortunately as with all good things it just didn't last long enough. Lis brought ALL kinds of toys along with her and we began to share. 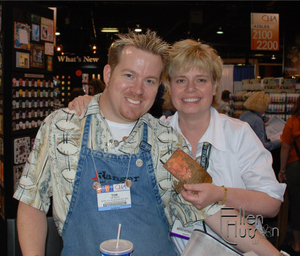 She shared her Ranger product knowledge with me and I shared my Copic coloring knowledge with her. Let me tell you - I LOVE Ranger products - LOL! Lisa also had her fabulous new CHF Backgrounders and Kim Hughes stamps along with her and so we went in to a stamping frenzy. Hopefully I will get these projects completed that I have started and be able to share them all with you over time. Tonight I'll start with the first three. 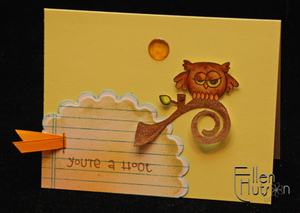 The first card I created uses the adorable owl that Kim drew. It is over the top - oh so cute!!! I began by showing Lisa how I color using the Copics - I started with the body and eyes of the owl and then inspiration hit. Lisa had shared the new Ranger Crackle paint effects with me moments earlier and that twig was just screaming at me to give it a try. What I learned is that when you spread a thin layer of the paint on your project you get tiny cracks, when you spread a thick layer you get larger cracks and thus came about the twig branch. I painted on the first layer very lightly and then gooped it on to the areas that I wanted to have a larger crackled effect. 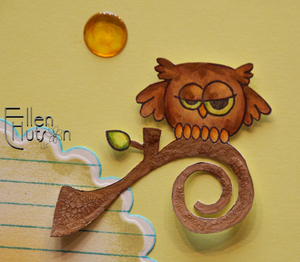 I also added a little to Mr. Owl so that he would have some texture as well. 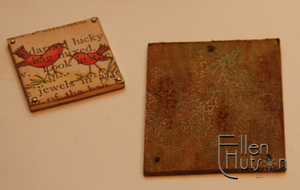 The paint colors coordinate with Tim Holtz's distress inks - they are several shades lighter than the ink. Thus when they dry you can easily apply the distress ink to really make those cracks jump out at you. Being that they weren't exactly corresponding with the Copic colors I had used I also added in a little YR24 to bring the branch colors a little closer to the colors I had started with, so that it would coordinate a little better. In putting the card together I needed a "moon", I tried a number of things - pearls, twinkle stickers, when Lis suggest Page Pebbles. Ahhh yes - I colored the Page Pebble with my Copics and had the perfect little embellishment in just the right color. Sorry about getting carried away with the airbrush - moral of the story - watch what you are doing when using this - don't try and do two things at once - LOL! The shape of course was created using the Classic Scalloped Circle Nestability and the ribbon color adjusted slightly with that same Copic marker I used on the Page Pebble. 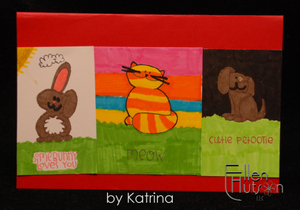 When I actually stamp my little Katrina likes to join in - especially when Miss Lisa is around Ü Kim's little critters are over the top adorable and Katrina just had to participate! So we have this series of three - the bunny is day time, the kitty is sunset and the puppy is night time (you can't see all the wonderful Glitter Pen stars she added to the sky). So see - it was worth the long drawn out project after all - I had one VERY happy little girl and she now has a special card to share with someone someday soon. I think she would love to hear from you - being that her eyes got huge when I asked if I could share her card on my blog Ü and she exclaimed in a voice of wonder - you mean it will be seen all over the world!!! So needless to say I think I need to get these little cuties for her. The next card is inspired by Kim Hughes - her "style" is so distinctive, and I love it - I do believe that she likes the Hambly overlays Ü Am I right Miss Kim? So I created my own overlay using the new Grid Background. This is another oh so me background - it takes me back to my years of interior design and all the drafting I spent hours doing on this surface. Yes, another background I can't live without!!! The snowman followed in fun flock, but alas it just was not dark enough to hold his own. So I repeated it in white embossing powder and voila - there he is just right! A few twinkle stickers, another background (this time Spanish Script) at an angle over the now gone Figgy Pudding paper (boy did I LOVE that collection!) and some Lily Kate ribbon and this project was complete. First I stamped Kim's tree and mailbox. I then added my hillside using the Copic Multiliner .3 - this was the best size to scale with Kim's images. I used my Copic markers and blender pen to create this beautiful blue background, I did top it off with just a hint of Prismacolor color pencils to bring out the texture of the Arturo paper, a little Spica Glitter Pen in Sky Blue and Red to add that hint of WOW and then just adhered it to a beautiful blue notecard - what a simple card to create, yet it has a ton of impact due to the icy colors. I almost put the sentiment "Frosty Greetings", "It's cold here without you!" or "Messages from you Warm my Heart", but I just left it alone being that I LOVE the simplicity of this design and I wanted to follow Dave's idea in a more "true" manner. I hope you enjoy this little adventure we shared and I do have some other wonderful ideas I hope to share with you as well over time. 'Tis the season to be busy right now, the kids will be out of school after tomorrow and my cold is still hammering away at my head. But creativity got to be a part of my weekend and for that I am so thankful to Lis for! You are such an incredible friend my sweet Lisa!!! If you have managed to read all the way here to the bottom - I must share that Debbie (Inchie Cards), Mish (Holiday Treats and ways to present them), Trudee (Cards), Sharon (Toile Lamp Shade) and Cindy (Amazing soldered jewelry with step by step directions!) have once again created projects that will truly INSPIRE!!! These ladies are so incredibly talented and they have blown my socks off yet again these past few days! So be certain to visit their blogs and leave them comments on their projects when you get the opportunity. Tonight I would like to present this fabulous kit that Michelle Wooderson has created! 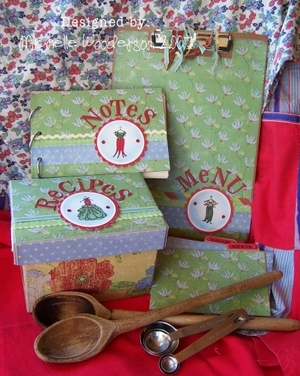 Well actually two kits - first there is the recipe box and secondly is the add-on kit of the clipboard and notebook. I am so thrilled to finally have these ready! Being that I love to cook this is one project that I can see myself making for my girls or perhaps even with them. Passing down recipes through the generations is something that really appeals to me. When I left home after college I spent hours pouring through my mom's recipe books, copying out my favorite recipes on to note cards, scratch paper and what not. To this day I have not truly organized all those fabulous recipes. I think it is due time!!! This ensemble that Mish has created would make a wonderful send-off gift for your child as they head out on their own adventures in life. It could be something that you create and add to over the years as you teach them to cook. Perhaps when they have learned to make a recipe they could then add it to their box. Or you could create a special box for a grandchild - what an incredibly special gift that would be! I know that my girls love my mom's cookies and baked goods. They always tell me what an amazing cook grandma is and it just warms my heart. They miss living close to grandma so they can eat her wonderful cooking! So I know that all of those recipes will be added to their box some day. The "main ingredients" for the entire ensemble are included in the primary kit - the recipe box kit. It will include all the letters, brads, eyelets, ribbon, etc. that will be needed to complete the add-on projects. Mish then created another pair of items to use up the remaining ingredients to flesh out this wonderful little ensemble. I would highly encourage you to get the add-on kit now as well if it interests you being there are a limited supply. Please be aware that the add-on kit. the clipboard and notebook, do not include the items listed above, so it would make no sense to purchase those items without the recipe box kit. We were trying to figure out how to package this to give you the best value for your dollar. Hopefully this will meet everyone's needs. So pop on over to our pick up your kits now. In completing tonight's post I thought I would share one of my mom's fabulous recipes with you - it is absolutely delicious!!! Beat eggs, add sugar and vanilla. Beat until thick. Mix cocoa with melted butter, add flour and nuts. Grease 9"x12" pan and bake at 325 degrees for 30 minutes. Remove from oven and spread icing mixture over top of cake. Boil for three minutes, then add 1/2 cup coconut. Spread over top of baked fudge squares. Allow to cool. ETA: I am so thrilled - my mom, who is now 77 has just started using a computer!!! She is reading my blog and I am SO excited. She called me today when she saw the recipe I posted. I can't believe I missed that last part about putting the recipe under the broiler. Thanks mom! Can you tell I don't have enough time to bake lately?!?! These are indeed the most scrumptious treats! Where have I been again? LOL! Well... filling orders, answering emails and phonecalls, and most obviously not blogging. This bronchitis is continuing to get the best of me and therefore by the time 9:00p rolls around I just can't work any longer and head to bed. Are any of you allergic to your Christmas tree? I am wondering if our tree this year may be the culprit for my cold just not getting any better. It appears to start getting better and then wham, back full force. These flowers all started when I fell in love with the Create-a-Cut. The manufacturers of this nifty and no longer to be found cutter shared with me how it is that they made these. I can not take credit for this idea at all. One of the girls was incredibly skilled at making these and it was while working with them that I discovered the fun of making these. Being that the cutter has pretty much disappeared I had to come up with a different way of making them, so that I could share these with you, and thus the move back to the old-fashioned decorative edged scissors. So pull those babies out and start putting them to good use once again. For the flowers on this month's project I used zig-zag scissors. Experiment with different scissors for different types of flowers. 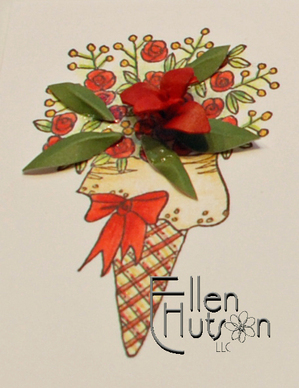 Scalloped scissors make great roses, deckled scissors can make beautiful carnations. These are so simple to make! It doesn't matter if you cut straight or have that crooked cut going on. In fact experiment with those crooked cuts to see what type of flower you can create. I have made some that are different heights in the center and longer around the edges. Think of a real flower and then see if you can figure out a way to replicate it. 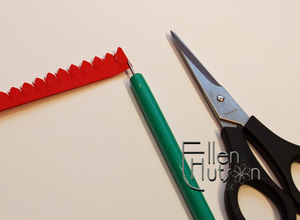 Begin by cutting a 1/2" strip of paper that is 8 1/2" in length. This will be enough paper for a number of flowers. 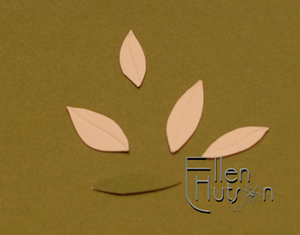 Then using a detailed pair of regular scissors you will cut your "petals" in to this paper strip. This is where variation can occur as well. 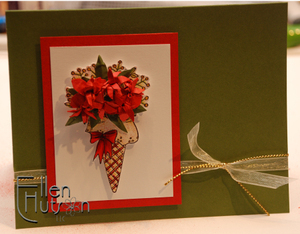 For these flowers, I wanted them to have more of an appearance of a poinsettia, so I cut the design shown below. As you can see the shape is somewhat rounded with little "slivers" in between each rounded shape. Each one of the zigs (or zags Ü) is 1/4" in width. Insert the paper in to the slotted tool. This little gadget is essential in making nice tight flowers in my opinion. As you can see I cut my long strip back in to manageable lengths. 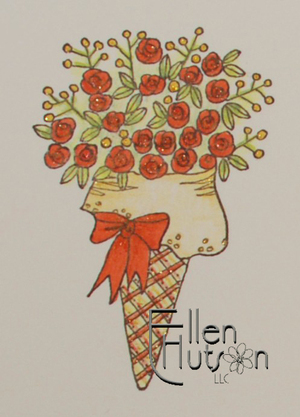 Most of my flowers for this card only use three or five of the little "zig-zags" to complete each piece. Lay down a tiny strip of glue - for mine I used my Making Memories ribbon glue - it comes out in a very small thread and thus is simple to use and manage. I'm certain that most any white glue will work though. You could apply it with a toothpick if need be. Do not apply glue to the spot that is next to the slotted tool. 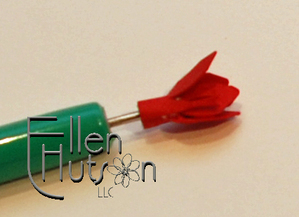 If you do you will end up gluing your flower to the tool. Start the glue application about 3/8" away from the end that is inserted in to the slotted tool. 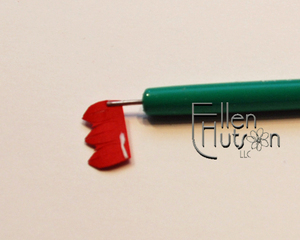 At this point you will then roll your paper around the tip of the slotted tool. In this case I rolled it tightly towards myself. Once I have it rolled in to place I hold it for approximately 30 seconds until the glue begins to adhere. I then pull the flower off the end of the slotted tool and lay it down to dry for a few minutes while I work on the next flowers. Once the base is dried cut it shorter. Envision the flower below with about 1/2 of the tight rolled base snipped off. This allows me to bring the flower closer to my paper when adhering it. Do not cut too much off though or you will end up with just a bunch of paper snippets. Yep, done that - in fact I still do sometimes when I cut too agressively in quest of that tight short flower - LOL! Next "roll" each petal back using your finger nail to form a floral shape. To determine how many flowers I need for my completed project I just sprinkle them around where I think they belong. For this month's card I made six flowers - (2) five-petal or five zig-zag flowers and (4) three-petal flowers (those shown above). Typically I like to use odd numbers, but in this case six seemed to look the best. Next cut out the leaves. Each leaf varies in length from 3/8" to 5/8". 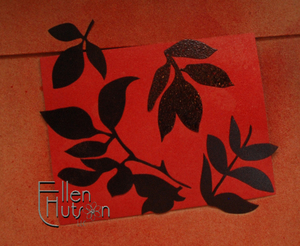 I freehand cut the shapes as shown below and then use a small embossing stylus to add detail to the leaf back. Hopefully you can see the simple line I drew in the leaf shape below. Next I shape and position my leaves. I began with only five leaves as shown, but as I worked on my project I decided it needed a few more and ended up using a total of eight leaves for the final project. I use two different methods to adhere the flowers and leaves - Diamond Glaze/Crystal Effects and glue dots. I have found that the Diamond Glaze/Crystal Effects holds a lot better, but it takes some time to dry and therefore you need to leave your project sit untouched until the glue is dry. When in a hurry I use glue dots, but they simply don't hold as well. 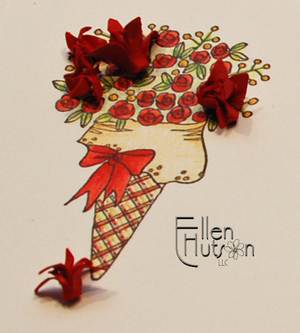 As the final touch I then cut out the entire bouquet and used dimensionals to pop the bouquet off the cardfront. The shadowing this creates adds realism to the whole project. OK - so now you know how to make paper flowers. I would LOVE to see what you all come up with so please leave me links or send me notes to share your versions. I bet you want to know what colors I used to color as well, don't you Ü I colored the entire image so that if you look down closely at it the project appears complete right through to the base. This month I started with Prismacolor pencils. I laid down the colors Poppy Red, Chartreuse, Sand and Goldenrod on the berries. Next I added in the darker hues - Scarlet Red and Crimson Red, Limepeel and Dark Green, more Sand and a little more Goldenrod. I then used my Copic Glitter pens in Red and Gold to add that final pizazz. Just a quick update - all the sale orders are out (unless you were one of the few unfortunate souls who encountered our miscount of inventory and ordered an item that we were off by one or two.) The good news is those orders will hopefully be going out this week being that our inventory is supposed to be restocked shortly. Our suppliers have done a remarkable job of filling the holes that were created by our sale. A huge thank you to all of them!!! The girls who create the Dew Drops have been sick with the flu too, but they are hoping to get our new order out to us on Monday or Tuesday, which means we should have them by week's end. I'll check back in with them so that I can update those of you who have already placed your preorders. It is so fun to see how many of you love the "unusual" little items we find. 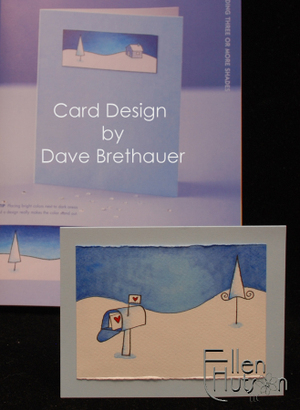 Many of you have sent emails, cards, and special things my way sharing your appreciation with me. I thank you SO MUCH for your kind words of encouragement, support and appreciation and the incredibly thoughtful items that have been passed my way. I am behind in my acknowledgements and feel awful about it - it is high on my priority list though. Please know that you are SO appreciated - I'm losing my mind being that my body is not cooperating. I guess while I'm whining about my uncooperative body I might as well fill you all in on the week ahead. This week is going to be another tough week to get things accomplished. I head to the foot specialist for a "fitting" this week. I'm really excited about that actually - LOL! They will be making a special "orthotic" (I think that is what it is called) to help my right foot. Then I head to the hip surgeon for yet another consultation - I'm not certain I'm so excited about that - LOL, but there is a huge part in me that knows I need to do this and therefore I am convincing myself to be hopeful. It appears we may have a "fight" on our hands with our insurance company. They will pay for the arthroscopy (a scope to look into the hip socket), but then will not pay for the reshaping of the femoral head and hip socket. At this time they believe this will help alleviate the problem of my leg collapsing under me. What's up with the insurance company anyways?!? They would pay for a hip replacement, but my doctor's believe that I really don't need a hip replacement yet. I am very happy for this, but... If any of you have word's of wisdom we might use I would love to hear them! OK - enough with the whining. I hope to be back soon with Michelle's kit and an Inchie Challenge. Word is out that you love what the girls have created. They are genius aren't they! I have more of Karen's to share with you and she will get some information up on her site as well. Karen and Scott lost their computer of six months this past weekend just as Scott was about to make the new images and an Inchie post go live. They are hoping to update their website by next weekend, but as with all things computer oriented one just never knows. Moral of the story - back-up, back-up, back-up to an off-site location. Yikes, computers can be our nemisis. Have a wonderful week and don't let the stresses of the season make your lives to crazy! I would like to thank you ALL for participating in our drawing for the Classic Scalloped Hearts. Yesterday was such a whirlwind and I wasn't able to get to bed until after midnight, so I should have posted our winner at that time. Alas I was exhausted and thought I'd do it first thing this morning. Well, we are madly packing orders and continuing to try and stay on top of any requests you might have and help those who are having trouble navigating through the store. Hee, hee - so you really want to know who won - don't you Ü I'm such a tease! I am THRILLED to share with you that our winner is number 80 - I counted through a number of times being that was a big number - LOL! And that person is... Donna Calamari ... please send your snail mail address, as well as telephone number for shipping purposes, to customerservice@ellenhutson.com and we will get these right out to you!!! I am still scrambling on our Stamp of the Month Packet - I completed the project last night extremely late and just didn't have the umph to get it to the final stages. I am working on that right now!!! Watch for it shortly. Instructions will be posted to our blog soon - you will then all know how to make those cute little paper flowers that I tempted you with a LONG time ago. Here is just a glimpse of what is coming! 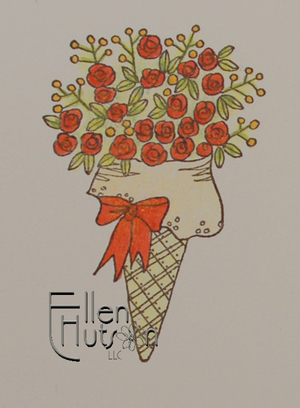 I thought these could be useful to send out as Thank You's for the gifts you have received during the holiday's using the new sentiment - "thanks a bunch"! Watch for an update to the store soon.